Best Sanitizers Alpet D2 surface sanitizing wipes. 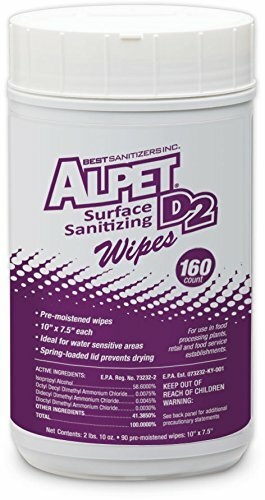 Alpet D2 Wipes come pre-saturated in a canister with a spring-loaded lid to prevent drying. That means less waste and an all around better value. 160 medium-duty wipes. Alpet D2 Surface Sanitizing Wipes are a ready-to-use, no-rinse, food-safe, lintless wiping system. Able to clean and sanitize for less industrial needs. Kosher, Pareve and Halal certified. 58 percent IPA/quat formula ideal for water sensitive equipment. Best suited for food service, food service/grocery, office wellness, industrial hygiene, healthcare, education, municipalities. If you have any questions about this product by Best Sanitizers Inc, contact us by completing and submitting the form below. If you are looking for a specif part number, please include it with your message.